Amazon, the country’s second-largest employer, has so far remained immune to any attempts by U.S. workers to form a union. With rumblings of employee organization at Whole Foods—which Amazon bought for $13.7 billion last year—a 45-minute union-busting training video produced by the company was sent to Team Leaders of the grocery chain last week, according to sources with knowledge of the store’s activities. Recordings of that video, obtained by Gizmodo, provide valuable insight into the company’s thinking and tactics. 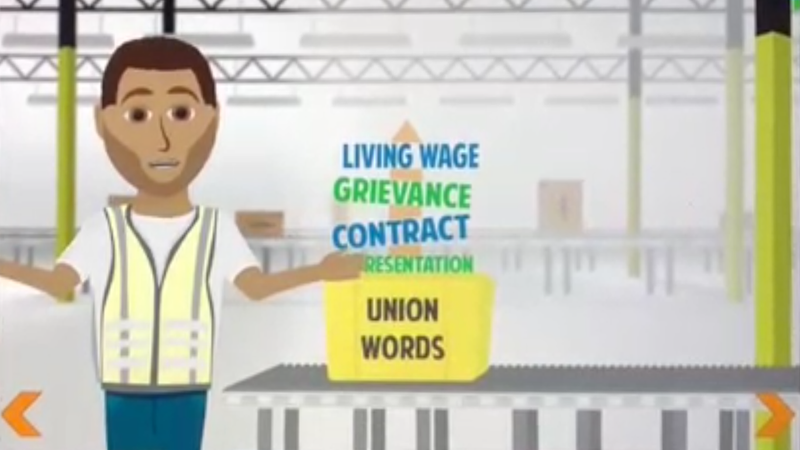 Amazon’s anti-union training video comes to light amid an image crisis for the company. Years of reporting on low pay and poor working conditions reached a fever pitch late this summer when Senator Bernie Sanders proposed legislation directly challenging the company’s reliance on social subsidy programs. Likewise, Amazon lost more than it gained in a charm offensive ploy that rewarded its warehouse ambassadors for tweeting nice things about the company—like how they are free to use facility restrooms and are not slaves. Gizmodo has opted to not publish the video itself in order to maintain source anonymity. Throughout, the video claims Amazon prefers a “direct management” structure where employees can bring grievances to their bosses individually, rather than union representation. However, a number of warehouse workers have expressed to Gizmodo in past reporting that they believed voicing their concerns led to retaliatory scrutiny or firing. “[Amazon] preaches that they have this open-door policy and then when you try to go through that open door, instead of being allowed in, you are now set up,” a former Fulfillment Center worker in Indiana told Gizmodo. “You’re somebody that talks and you’re somebody they’re gonna absolutely make the job as difficult as humanly possible for.” Another Floridian Fulfillment Center worker told Gizmodo he sent complaints of low pay to Amazon CEO Jeff Bezos’s public-facing email address (jeff@amazon.com) and claims management was “harassing me since I sent that email.” He said he was terminated shortly afterward. We’ve reached out to Amazon for comment regarding its response to employees who raise concerns and will update when we hear back. T.I.P.S. are the tactics Amazon advises management not to use, according to the video. The training video then asks managers to listen to 10 hypothetical employees and select whether their remarks constitute a “warning sign” or “innocent interaction.” Workers loitering in the break room after their shift, asking for a list of the site’s roster, or complaining about the absence of a living wage fall into the “warning sign” category. Throughout, managers are encouraged to express opinions against unions to their workers, and any of signs of potential organization are supposed to be escalated to human resources and general managers immediately. Sadly, these kinds of tactics are not unique to Amazon. Target, Lowe’s, and Walmart have all faced criticism in recent years for producing training videos intended to quash employee organizing. Amazon declined to comment on the record on the video but told Gizmodo it shares training videos regularly on many topics. By any indication, Amazon is seriously concerned about the prospect of Whole Foods, or any arm of their business, becoming unionized. Maybe it’s time for workers to consider why their bosses are so worried. Update 2:30pm: After Amazon declined multiple requests to comment for this story, the company issued the following statement proceeding publication. Amazon asserts that we “cherry-picked soundbites” from the video and that our characterization does not convey Amazon’s “view on how to create career opportunities for employees.” We’ve published the statement in full below and requested that Amazon share the video with us so that readers can watch it for themselves. “We’re perplexed as to why Gizmodo takes issue with a company wanting to better engage its employees, train hundreds of managers to maintain an open and direct dialogue with associates, and create channels to drive innovation on behalf of the customer in a caring and inclusive environment. The reporter clearly cherry-picked soundbites from the video to meet his editorial objective and do not align with our view on how to create career opportunities for employees. Have information on Whole Foods, or Amazon in general? Send us a tip via email, Keybase, or anonymously via our Secure Drop server.